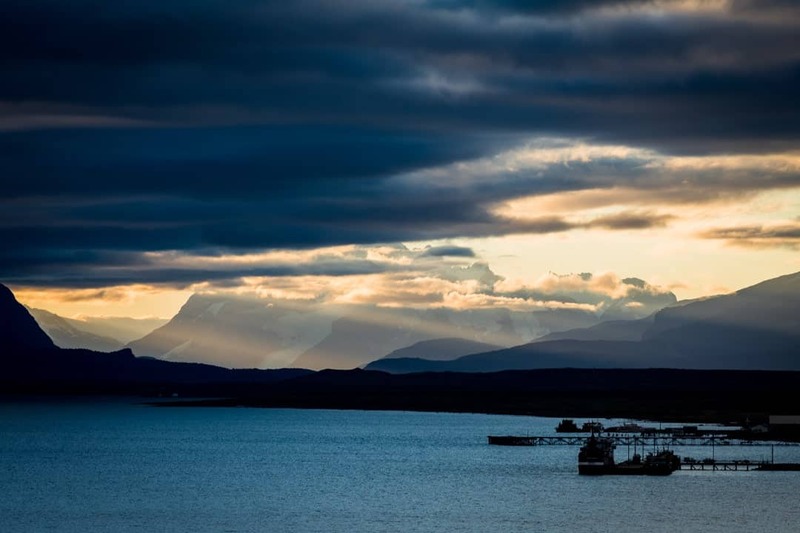 We spent a lot longer than expected finding the best things to do in Puerto Natales, Chile. Spoiler alert – we loved it! That’s exactly how we felt about Puerto Natales. Located at the bottom of South America in Chilean Patagonia, Puerto Natales is known as the gateway to Torres del Paine National Park. That distinction alone is usually enough to bring people to this quaint, colourful village on the edge of the Señoret Channel. But this place deserves a lot more time than a just brief stopover. Looking for more adventure? 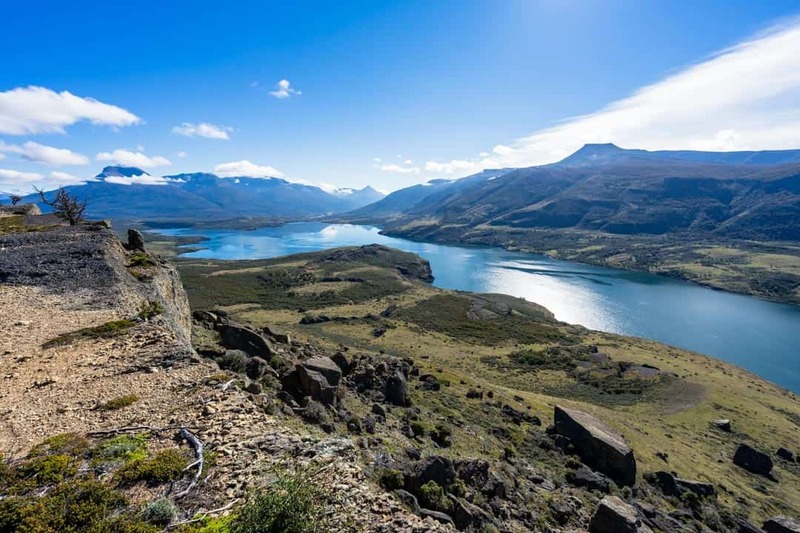 Check out our ultimate guide to hiking in Patagonia. We ended up spending almost 10 days in Puerto Natales, getting prepped before the O Circuit, in between our visit to EcoCamp Patagonia, and before jumping on our amazing glacier cruise through the Chilean Fjords with Skorpios Cruceros. During that time we grew a deep fondness for the little town, and could even envision ourselves spending much longer there. 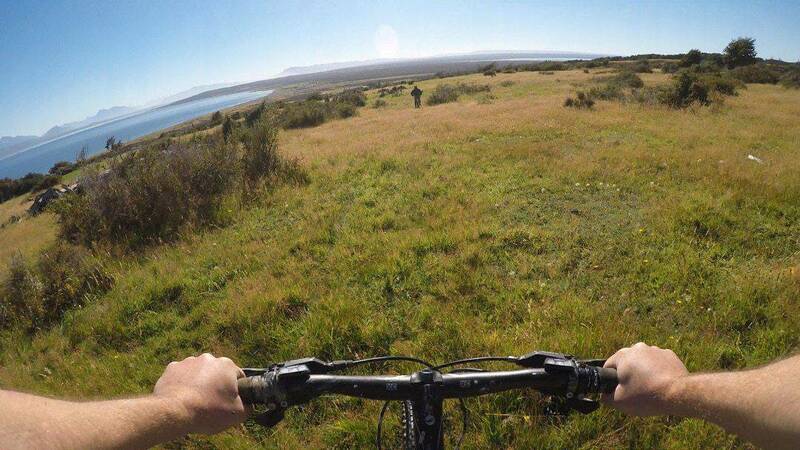 While there isn’t a lot to see in the town itself, the outskirts offer some incredible adventure opportunities. 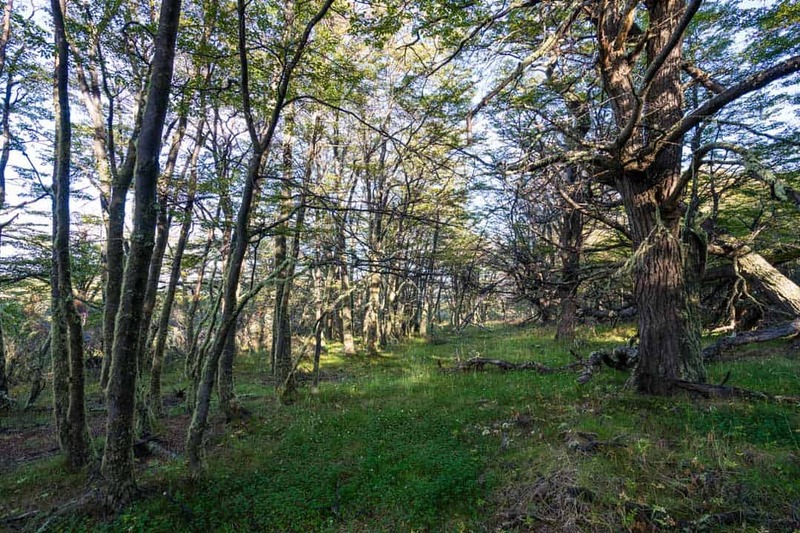 Whether you’re in Puerto Natales for a few days or a few weeks, make sure you explore the nature that surrounds it! 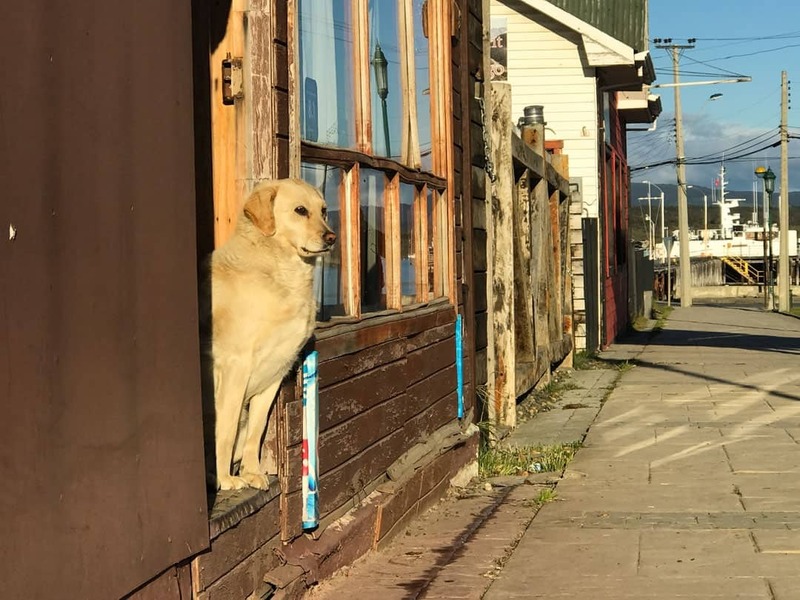 The dogs in Puerto Natales are super friendly! On our first day in town we jumped off the bus and headed to our guesthouse, Kaluve Patagonia, and were met by the smiling and caring manager there. Her friendly demeanour immediately made us feel at home, and helped set the mood for the rest of our stay. We dropped our bags off in the surprisingly large and comfortable room and headed into town to see what we could find. The downtown section of Puerto Natales is wide and bright, with a few trees scattered around the ageing houses and shops. Fat, stray dogs laze in the sun, looking healthy and incredibly friendly. Everywhere we went we’d find some curious pup who would want a pat and instantly became our companion. We loved this aspect of Puerto Natales! Heading to the shore there’s a lovely seaside pathway and an iconic burnt pier that makes for excellent photographs. A big skatepark is pumping with kids throwing tricks down and couples walk hand in hand as the sun sets. A lovely spot to be! 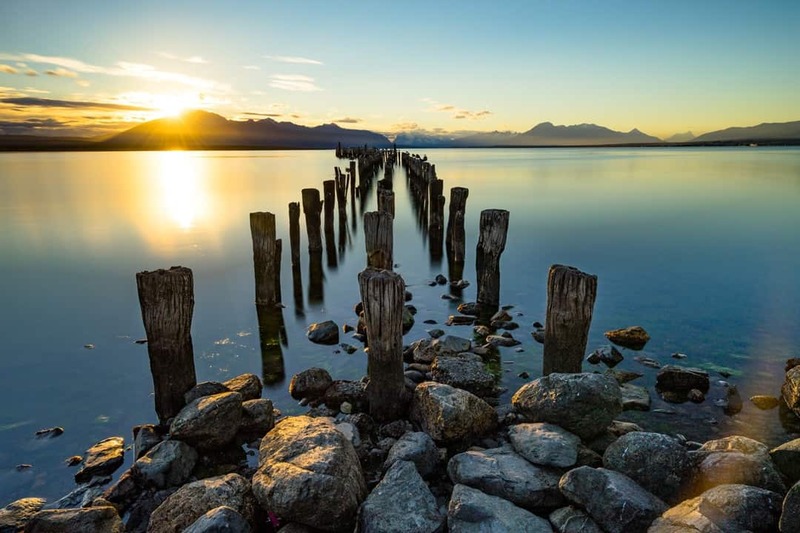 The famous burnt pier in Puerto Natales. 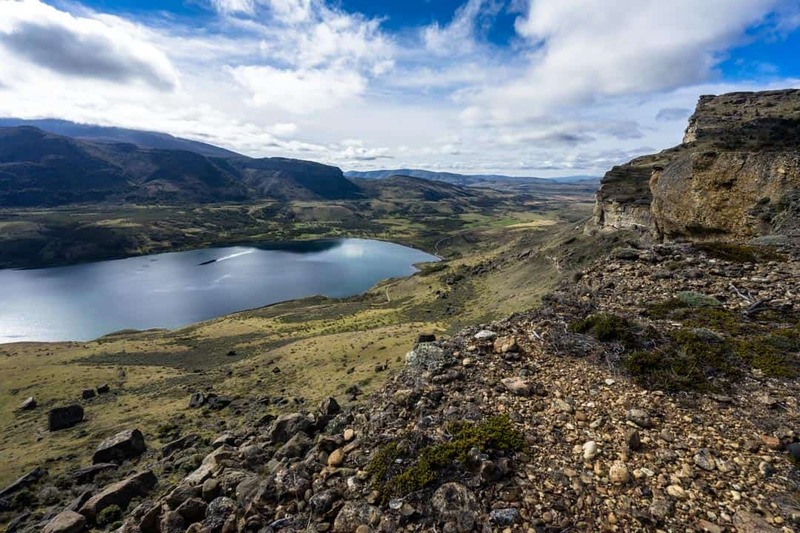 Being the gateway to one of South America’s most popular trekking destinations, and a hub for backpacking in Patagonia, Puerto Natales has a huge amount of adventure stores filled with the latest and greatest (and therefore expensive) equipment you could ever want. We were really surprised with this for being in a town almost at the end of the earth. 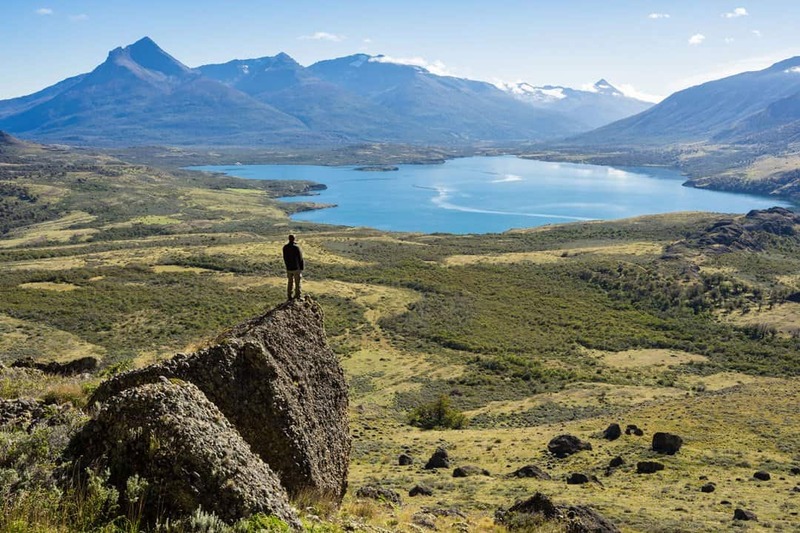 You could literally show up with nothing and leave Puerto Natales ready to summit the highest peaks on the continent. In addition to this every third store offered camping gear rentals, so if you didn’t want to buy all your equipment you could at least pick some stuff up for a few days. Luckily for us we were already kitted out with our Kathmandu camping gear that we’ve used around the world, so the only thing on our shopping list was a couple of trekking poles and a knife to replace my Leatherman that was stolen in Buenos Aires. With the shopping finished in about 10 minutes we found an Italian restaurant called Mesita Grande that came highly recommended and tucked into a delicious and cheap meal. This would not be the last time we ate here. Afterwards we moved to the iconic Base Camp Pub for a selection of large, cheap beers in a small bar packed with backpackers and trekkers. Before too long the place was closing and we were stumbling out. Again, something that would happen over and over again in Puerto Natales. The next day was a prep day for our O Circuit trek in Torres del Paine, and we hurriedly ran around buying all the food we’d need to keep us alive for 8 days on the trail. Unfortunately it was a Sunday and most shops were shut, so keep that in mind if you’re in town on a Sunday! 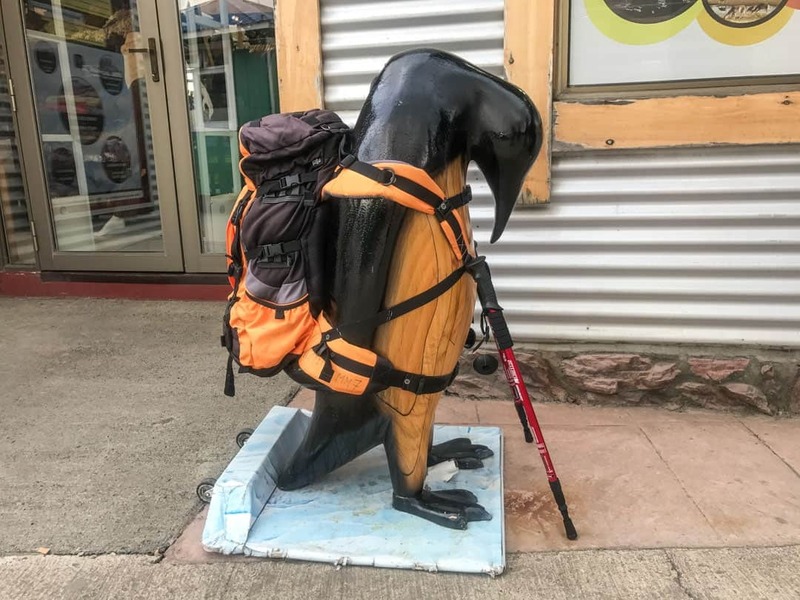 A backpacking penguin – just one of the quirky things to be found around Puerto Natales. With the excellent vibe we felt in town we knew we’d made a good choice to use it as a base between adventures. After the O Circuit we returned for 2 nights to do our laundry, check emails and consume huge amounts of pizza and beer at Base Camp before heading back into the park for 4 more nights at EcoCamp. EcoCamp was one of the most wonderful travel experiences we’ve had, and we were sad to leave. When we got back to Puerto Natales we settled back in to our usual routine of working, eating food and drinking, this time staying closer to the sea to mix it up. This time round we found out about an amazing cafe called The Coffee Maker that had delicious drinks and an excellent environment to relax and bust out some work. 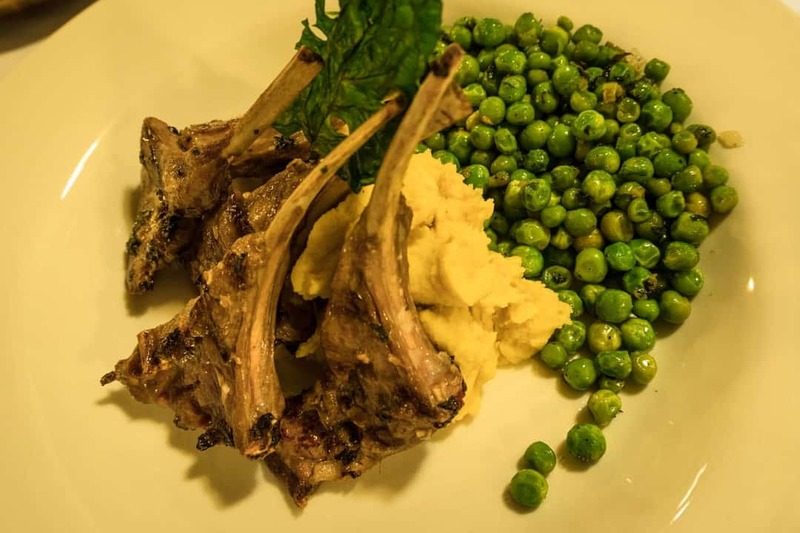 The days passed leisurely, and before too long it was time to step up our game in Puerto Natales and move onto one of the most famous places in town! 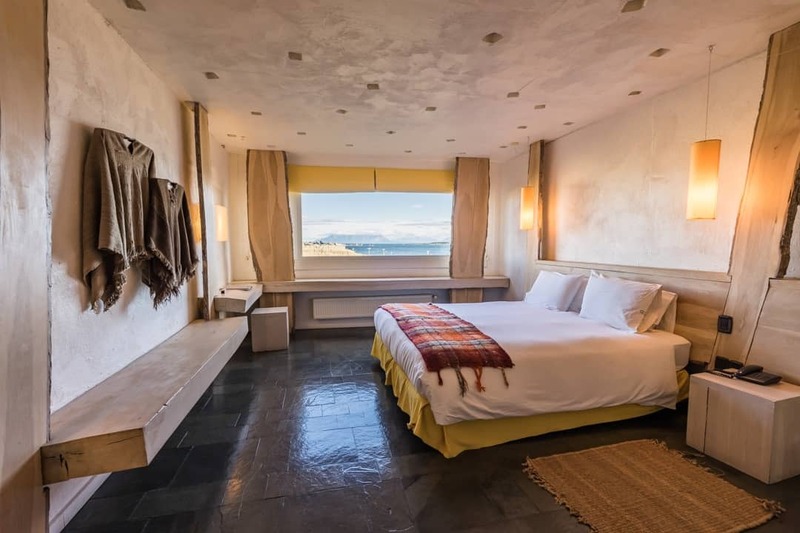 We had organised to spend two nights at the famous Remota Lodge located about 2km out of town on the edge of the Señoret Channel. 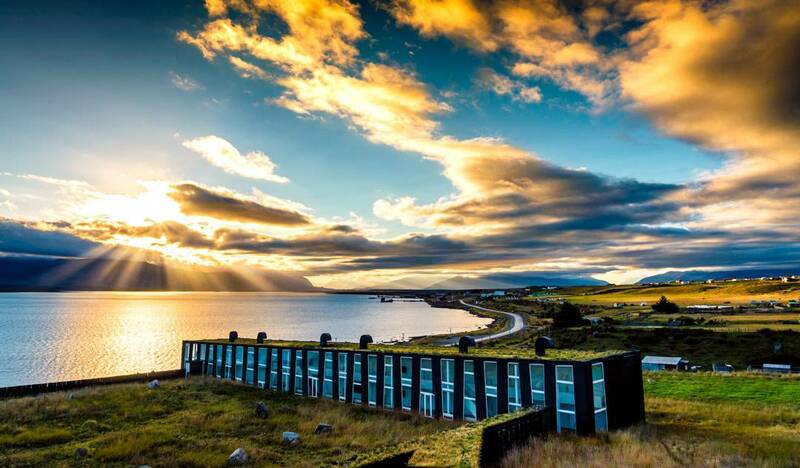 From the outside Remota Lodge has the unusual appearance of being a renovated warehouse or factory. We later found out that the architect was inspired by the sheep shearing sheds that populate the estancias around Puerto Natales. But the exterior is where the comparisons stop. Inside the luxury hotel is a like stepping into design revolution. Enormous windows look out over carpets of grass that appear to tumble into the sea. Huge art pieces influenced by the indigenous Kaweskar people are displayed throughout the sprawling complex. Open sitting areas make it easy to find a tranquil spot to rest. One of the fireplaces at Remota. One thing that makes Remota unique is the grass-covered roofs. This allows the sloping structures to blend into the surrounding environment. Best of all you can even climb onto the main roof with drink in hand and have unrivalled views over the fjords. Towards the bottom of the property is the swimming pool and sauna. It seemed to be a bit out of the way, but if relaxing in an inside hot tub with sea views is up your alley, it’s worth walking to. We checked in to our luxurious room and reluctantly pried ourselves off of the comfortable bed to get back into the bar. While you can just book a room at Remota, we were on their ‘Soft Program‘, which is an all-inclusive package with food, drinks and activities. Naturally we grabbed a boutique beer and found a nice spot to while away the evening. Our beautiful bedroom at Remota. The food at Remota Hotel is next level, and we really mean that. As part of the all-inclusive packages you are free to pick anything you want off of the menus, from starters, salads, mains and desserts, whether it is lunch of dinner. Breakfast is a quality buffet. So much of the food is typical for the region around Puerto Natales, and being an almost-coastal town means seafood is almost mandatory. The first night we gorged ourselves on salmon, bass, ceviche and mussels, all downed with pisco sours and Chilean wine. For the next evening we opted for the meat dishes, and huge racks of marinated lamb and juicy steaks ensured we went to bed feeling a lot heavier. One thing that really caught our interested was the guanaco on the menu. Known as the South American camel and related to the llama, this creature has been a staple diet for farmers for centuries. Having seen them all over Patagonia, we were keen to try one. Honestly – The guanaco was ok, but nothing to write home about. Still, that didn’t stop us from having it twice (when would we get the chance to eat guanaco again?). The food at Remota was gourmet in every sense of the word, and when the wine and beer is free-flowing it’s hard not to wish you could just stay there for an extra day, or three. As part of Remota’s ‘Soft Program’ we were assigned a young guide named Pedro from Valparaiso who would be our dedicated fun coordinator. On the first night we met Pedro and he sat down with a huge map of the region and told us all the things we could do. Rather than having a strict schedule we could pick and choose what we wanted to do and where. Seeing as we had already spent 12 days in Torres del Paine we decided to skip that part and focus on the areas around Puerto Natales that we had so far neglected. Jazza standing on a rock with amazing views from the backside of Puerto Natales. We had the choice to do some hiking in any number of regions, horse riding, visit a working estancia or mountain biking on a number of different technical levels. Based on Pedro’s recommendations we decided to hike around the Cueva del Milodon and visit some cave paintings one day, and then tackle some mountain biking south of town the next. After a big breakfast we jumped in the van with Pedro and made the short drive to the cave. As we’d already visited the Cueva del Milodon, Pedro decided to skip that part of the tour and get us straight into the nature. Weaving through mellow terrain we were surrounded by huge chunks of conglomerate rocks, geological evidence left behind from the last ice age. Entering a beautiful forest near the cave. Soon we entered a lush forest, towering trees covered in lichen created a startling contrast from the desolate steppe we had been in just moments before. This was the start of our climb towards the summit. Pedro had promised that he knew a great spot to have lunch, and as we kept gaining altitude we knew he wouldn’t disappoint. Just as our stomaches were growling we stumbled over a peak and were greeted with an impressive view of Laguna Sophia nestled between Patagonian mountains and rolling clouds. Pedro was right, and we pulled up to enjoy a delicious chicken salad. Not a bad lunch spot! Feeling energised Pedro then led us to a set of petroglyphs that are tucked away in a small rock overhand. 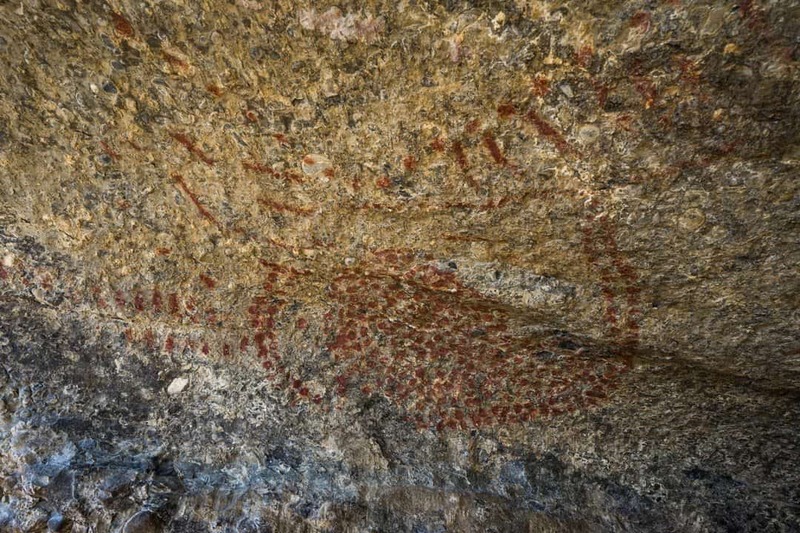 No one knows exactly how old these spirals and dots are, or what exactly they mean, but Pedro said they couldn’t be more than 1000 years old at most. These can be hard to find, so having a guide is almost essential to see them unless someone draws you a decent map. The finish line was close by, and we spent an hour walking down to the shores of Laguna Sophia to meet our waiting van (and an cooler full of beer to celebrate) and head back to the hotel. The petroglyphs of Puerto Natales. 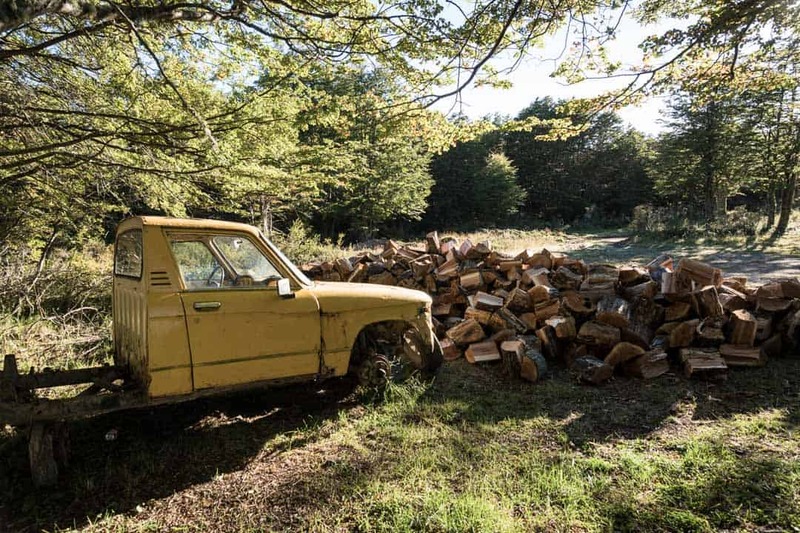 On a private estancia 45 minutes south of Puerto Natales Pedro and his friends are developing a series of trails with the permission of the land owner. They stumbled across this beautiful seaside property while out fishing. The owner happened to be on the shore and waved them in to have a drink with them. One drink turned into many, and he told Pedro and his mates that he wanted to open his station up to adventure tourism. An old truck on the estancia. 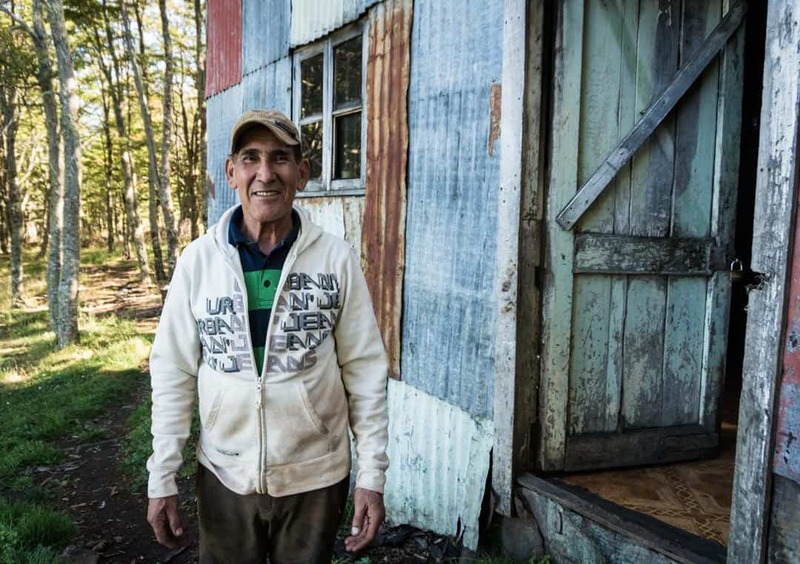 The lightbulb went off in Pedro’s head and he organised Remota to have exclusive access to the property and create biking and hiking trails. The property really is stunning, and with Giant hard-tail bikes loaded in the back of the truck we bounced our way to the top of the estancia. For the next few hours Pedro led me down twisting roads and paths that dissected the estancia, through deep puddles and eventually pulling up at a small beach. On the way back to the starting point we tried a new way that Pedro hadn’t been down before, and much to our amusement we ended up in a huge swamp area, trying our hardest to pedal through knee-deep mud. Despite becoming filthy, it was a lot of fun! Pedalling hard through a deep puddle. Once we got back to the waiting truck we met one of the station workers, who also happened to be a friend of Pedro’s. He welcomed us into his little house and we sipped on mate to get our energy levels up for the funnest part – the downhill! Saying goodbye to the worker we bombed it back to the bottom of the estancia, flying down cattle paddocks and launching off of dirt mounds and rocks. The views of the fjords as a backdrop were pretty damn incredible, and it occurred to me that, excluding the backcountry of British Columbia, this may be one of the most beautiful places I had ever mountain biked. Pedro beat me to the bottom, and when I caught up we cheered and hugged with stoke levels high! Knowing that this trail is only open to the guests of Remota, and that I was one of the first tourists he had ever taken there, made the experience all the more special. Once we returned to Remota Lodge there was just enough time for me to scrub my boots and clothes clean, gorge ourselves on a huge lunch and down it with delicious beer before we left for our Skorpios glacier cruise. The kind station worker who welcomed us into his house (behind him) and gave us a lot of mate, the strong caffeinated concoction loved by people in this part of the world! 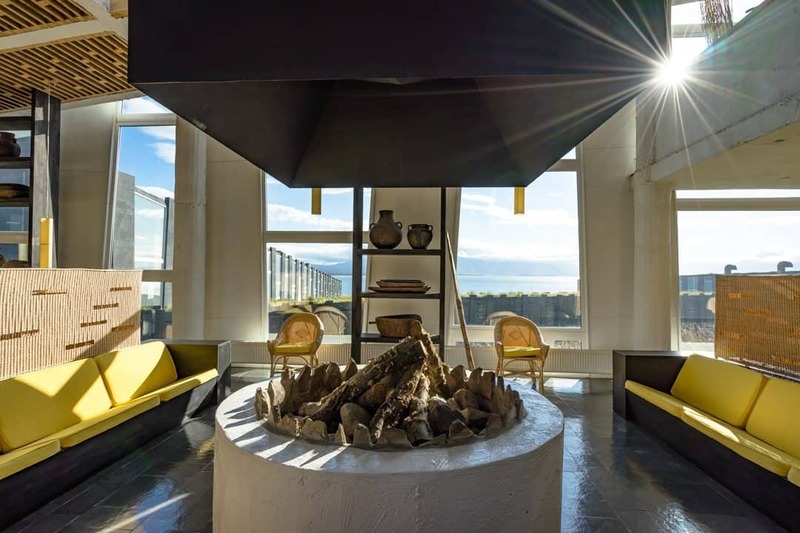 Having a taste of luxury, with an enormous dose of adventure and adrenaline thrown in, it at the end of our time in Puerto Natales was the perfect way to conclude our love affection with the town. When we returned from the Skorpios Cruise (which in itself was amazing) we had only one night before taking an early bus to El Calafate and the next chapter in our Patagonian adventure. Looking back we still have fond memories of Puerto Natales, and if the opportunity arose we wouldn’t hesitate to get back there. 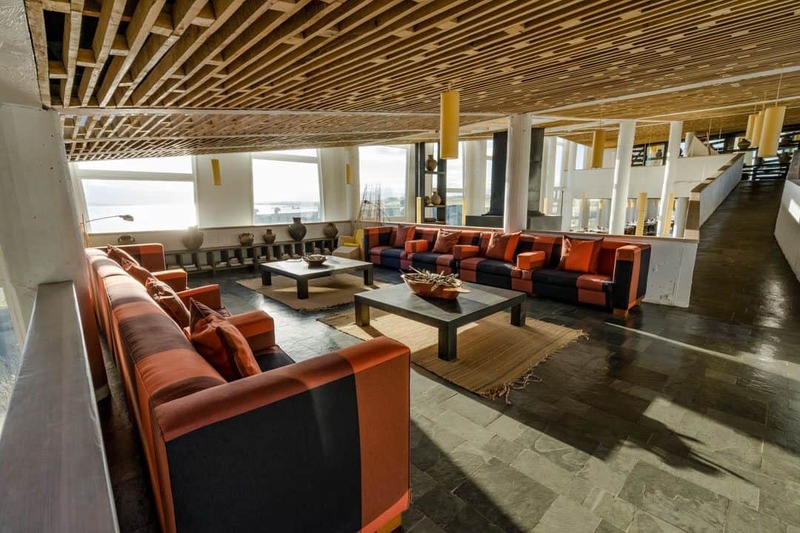 Being the gateway to an adventurer’s paradise with a picturesque setting, tranquil vibe and elements of fun-packed luxury at Remota Lodge makes Puerto Natales one of the coolest places to visit in Chile. Do yourself a favour and allow yourself more days than necessary to fall in love with it as much as we did. We were invited as guests of Remota Lodge during part of our time in Puerto Natales. 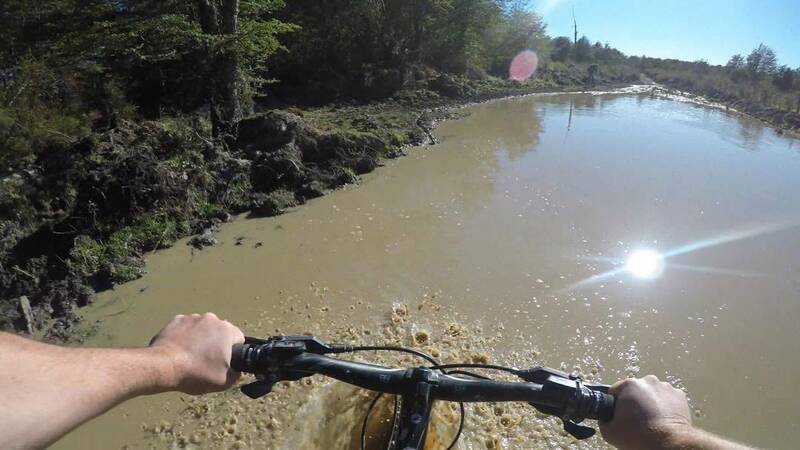 All thoughts, opinions and kilometres spent pedalling through mud is, as always, our own. Great post guys! I absolutely love Chile – its an incredibly diverse country and is great for adventuring and exploring, which I see is something you guys have found out too! I didn’t go mountain biking but I climbed a mountain and then slid down it which was one of the most exhilarating things I´ve ever done! You’ve written a great account of a beautiful country that is definitely worth exploring in depth. Thanks for sharing Mark. We are loving Chile. We are heading north at the moment. We really loved Puerto Natales. I will pop on over and have a look at your article. Happy travels.